In Portland, the best way to fake being a local is to ditch your four wheels. Public transit in this city, often named “cleanest” and “greenest” by magazines, is so easy to use that on some days there are as many visitors as commuters hitching a ride. The MAX light rail system, a new aerial tram, and a modern streetcar line will whisk you nearly anywhere you want to go. See Portland’s quirky side on a Portland walking tour, where you’ll hear the interesting stories behind things like 1,912 bronze drinking fountains and skateboarding lanes. If your idea of a walking tour involves trendy fashions and chic home decor, the northwest Pearl District is your oyster. Experience the city’s arts, crafts, and the talented residents who create them at the much-adored Portland Saturday Market, a local institution. Then stray from the beaten path and head just outside city limits to Sauvie Island. At Blue Heron Herbary you can pinch, sniff, or graze lavender, chocolate mint, and more than 275 other herbs. The secret garden backs onto a wildlife preserve along the Columbia River. 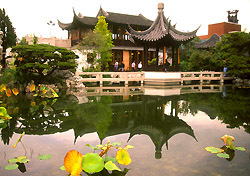 Two other must-see gardens: the International Rose Test Garden, a free, signature Portland landmark with more than 8,000 roses; and the Portland Classical Chinese Garden, an entire city block of tranquility. Sip amazing loose-leaf teas in the tea room of the Chinese gardens or at the Leaf Room in the bohemian Belmont neighbourhood. For more planning tips, go to the Portland visitor’sbBureau website. Have a recommendation for Portland, or another great getaway in Oregon? Post your comment below.